Almost 800 Virgin Islands government employees are expected to see salary increases in this week’s paycheck, the V.I. Division of Personnel announced in a statement issued Monday by Government House. Gov. 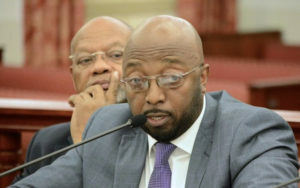 Kenneth E. Mapp told Senate President Myron Jackson on Friday that raises had been processed for about 700 employees as a result of the Executive Orders signed last month. The governor’s directives increase the public sector minimum wage to $13 per hour and raise base salaries of teachers, social workers and other vital government workers to “help the territory to retain and recruit a robust workforce,” the Government House news release said. Mapp announced July 30 that a portion of the revenues from the government’s agreement with ArcLight Capital and Limetree Bay Terminals for the development of the one-time Hovensa refinery would be put toward salary increases for government employees. The announcement of the governor’s pay raise plan brought a protest from the Legislature, which challenged Mapp’s authority to set the new base pay, citing the Revised Organic Act, the federal law setting up the territory’s government. The act gives the Legislature, not the governor, authority over spending, according to the Senate’s legal counsel. Attorney General Claude Walker got involved, asserting at an Aug. 9 press conference that the governor can move funds around from lump sum budgets without legislative action. Walker and Emile Henderson III, Mapp’s chief legal counsel, repeatedly emphasized government employees are underpaid and deserve more, as they asserted the governor had the legal authority to take this action.In Monday’s announcement, the Division of Personnel reported that, as of Monday afternoon, adjustments to 74 more Notice of Personnel Action documents, called NOPA in bureaucratese, had been completed, bringing the total number of employees to receive a larger paycheck this week to 774. “We are continuing to process NOPAs daily and all affected employees will receive wage increases retroactive to Aug. 1, 2018,” the governor said. Personnel Director Milton Potter said that his department has processed the most raises for Education Department employees and firefighters,” but by the end of the month almost 2,000 current employees are will see a bigger paycheck. Potter said many more Virgin Islanders eligible for raises will receive them next month when the paperwork is completed. The Governor noted that the minimum wage for public sector employees had not been increased in more than a decade, while a law was passed in 2016 implemented a more than $3 hourly increase for private sector workers. The new executive order increases the minimum wage for government workers to $13 per hour, or $27,040 annually. Personnel has identified a total of 1,217 employees who will be impacted by the $27,040 minimum wage, with over 700 more positively impacted by the new starting base salaries, a ccording to the Government House statement. “It is about providing a living wage for all workers in the Virgin Islands,” Mapp said.